If that picture looks like an offering being made to the heavens, well, it should. Because right now, I'm about to say three words that may change your dessert-eating life forever. 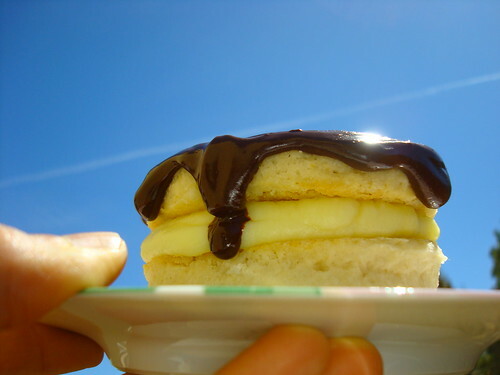 Those words--those beautiful, heavenly words--are Boston Cream Shortcake. Go ahead, say hi. Now, this series of words probably sounds familiar. Probably you're like "well, I know Boston Cream Pie, and I know Strawberry Shortcake." Well, I'm glad that you thought those things, if you did. Because this treat is a beautiful combination of the best parts of those desserts. 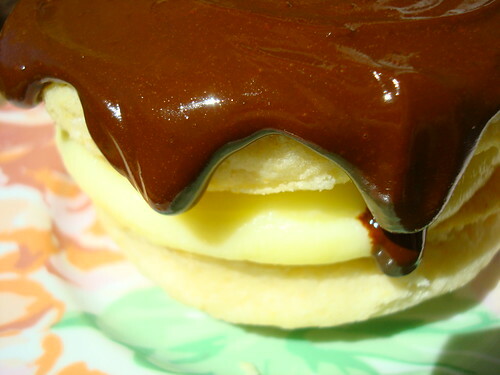 Boston Cream Pie is an almost perfect dessert. It's got cream. It's got chocolate. But the cake? It's way too spongey and dries out too quickly. Some might argue that this makes it a great "sponge" to absorb all of the creaminess. I personally find that it's more like soggy stale cake, though. And then you've got strawberry shortcake. 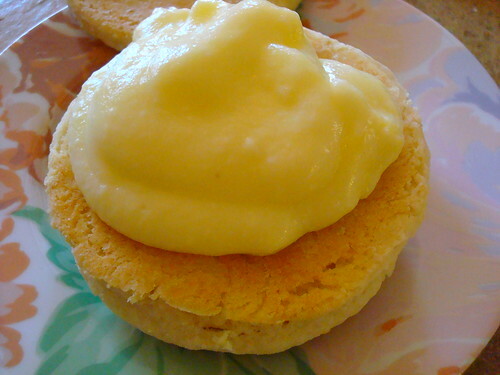 When served with biscuits--do not even waste my time with that sponge cakey kind--this is a dessert of great beauty. 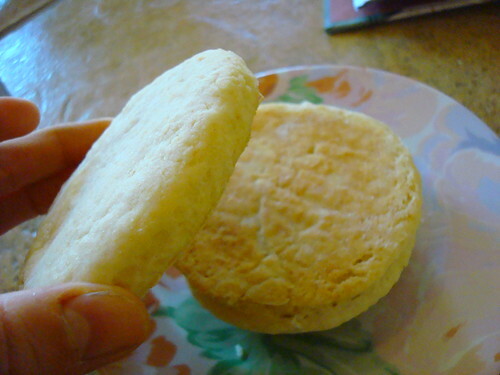 Buttery biscuits. Gorgeous whipped cream. If only it weren't for those healthy strawberries. I mean, what is this, a smoothie? I'm not on a diet! So...why not combine the best parts of both desserts, and end up with something totally amazing? And then, I referred to my own newest oeuvre, The Secret Lives of Baked Goods: Sweet Stories & Recipes for America's Favorite Desserts (it's out on May 7--lucky you!) , for the Boston Cream pie filling and topping. 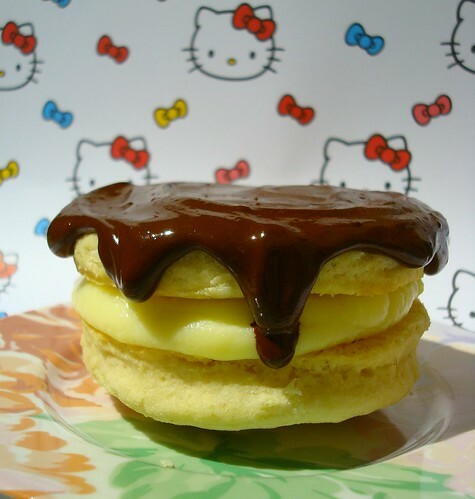 I'll be honest, in the book the recipe has a regular old cake in the Boston Cream Pie recipe. I now wish I could go back and make it a biscuit. 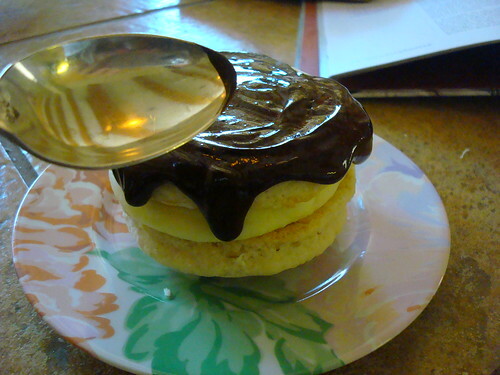 Actually, I wish I could edit every recipe ever for Boston Cream Pie and make it a shortcake. (OK, I am kidding. 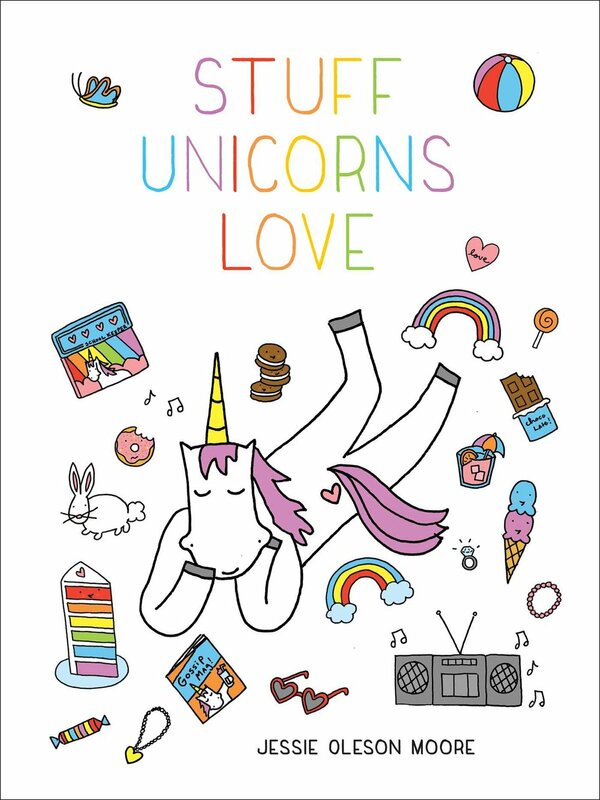 Sort of). So anyway, I didn't need to make the cake since I had the biscuits already. 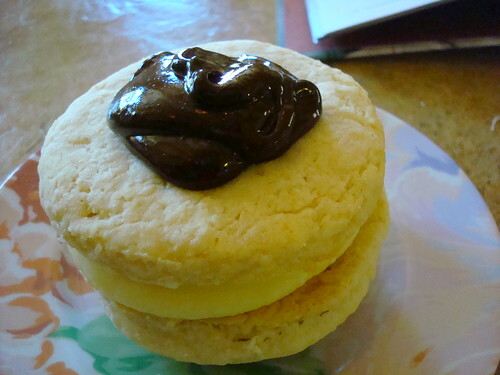 When it came to the cream and ganache, though, I decided to halve the recipes, since I didn't have too many biscuits left to fill. Let me tell you, it's a strange thing to prop open your own book and bake from it--but it's stranger still to adapt the recipe. 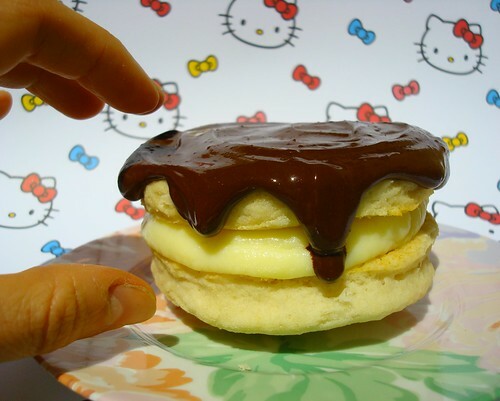 I made up the half-batch of cream and ganache, and you know what? Both worked perfectly when halved. Just in case you ever need that info. So, here's the way I made them. First, pair biscuits together so that like-sized ones were mates. Face one down and one up, so that the bottoms are facing together. Got it? 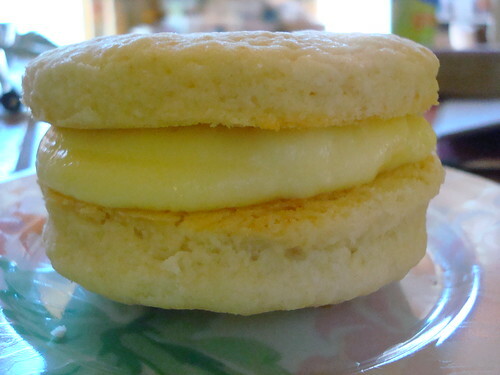 Now, spoon some of the cream filling on to the "bottom" biscuit. Not too much or it will shoot out the sides. It will still taste good even if it does that, though. Now, put biscuit 2 on top of it. Facing so that the bottom is the part going on top of the cream. Got it? Ok. Now, spoon a little of that lovely ganache on top. Yummmm. Let it drip over a little, it's ok. Serve immediately, or refrigerate until ready to serve. These do taste best the same day made, dig it? To make the filling (called "pastry cream" in French pastry parlance), in a medium saucepan over medium-high heat, combine the butter, milk, and cream. Bring to a simmer, then remove from heat. In a medium bowl, whisk the sugar and cornstarch until combined. Add the eggs, beating until the mixture is light yellow and form ribbons when you lift the whisk, about five minutes. Slowly pour the milk mixture into the egg mixture, whisking until completely combined. Pour the mixture into a medium-size pot and place over medium heat. Cook, whisking constantly to keep the eggs from scrambling, until the mixture begins bubbling; continue whisking until the mixture has thickened to the consistency of a pudding; this will happen shortly after it comes to a boil This process can take up to 15 minutes. If any bits of egg have cooked, forming lumps, strain the mixture through a mesh sieve before proceeding to the next step. Transfer to a bowl and press plastic wrap directly onto the surface of the custard, to keep a skin from forming. Refrigerate for several hours, or until completely chilled. To make the chocolate glaze, in a medium saucepan over medium heat, bring the cream to a boil. Place the chocolate in a medium bowl; pour the hot cream over chocolate, stirring until chocolate is melted and well combined. Set aside to cool slightly, about 10 minutes.